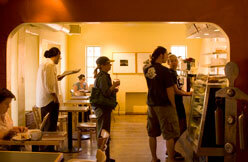 The Raging Sage Community begins at our cafe in Tucson. From our employees and customers, to our suppliers and surrounding neighborhood businesses, Raging Sage thrives because of the members of the community who come through our front door on Campbell Avenue. As well as being active in the community on a civic level, we believe in supporting individuals and local and national organizations that supply good will and aide to others or are in need of support themselves. Our annual Thanksgiving Benefit Breakfast has raised funds for the victims of Hurricane Katrina, Doctors Without Borders, Tucson Community Food Bank, Save the Children, and other charitable organizations. Our customers keep Raging Sage thriving. We owe thanks to them for their loyalty and promotion by word of mouth. Local musicians on the patio at Raging Sage. 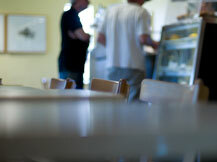 Thank you to the customers who stand in line everyday - frequently out the door - for their coffee and scone. Our employees are trained, courteous, and stay with us. They are the backbone of our organization.